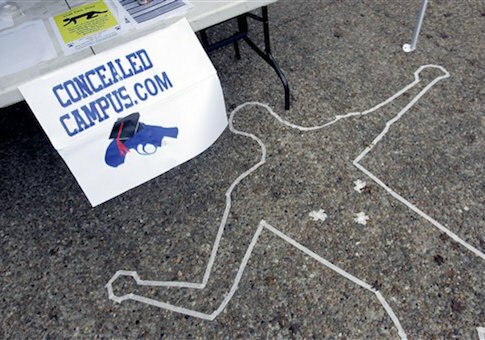 College students in Florida and Texas saw actions taken this week that would allow for concealed carry of firearms on college campuses on the eve of the second anniversary of the Sandy Hook school shooting. The Students for Concealed Carry FSU appealed to lawmakers to lift a ban on firearms on campuses after the shooting in its library. It sent a letter to Rep. W. Gregory "Greg" Steube, (R.) urging legislation to allow guns on campus, according to Erek Culbreath, president of SCC at FSU. Earlier this week Steube introduced a bill calling for firearms to be permitted on college and university campuses. The companion bill in the Senate, SB176, was filed Thursday morning. The two-year anniversary of the Sandy Hook school shooting that claimed the lives of 20 students and six adults at the elementary school will be marked on Sunday, Dec. 14. The suspect also killed his mother and himself. "I think it (the attack) brings it closer to home for people who think these events don’t occur in Florida, or that law enforcement can prevent them from happening," Steube told the News Service of Florida on Tuesday. SCC has been advocating for allowing firearms on campus for years, Culbreath told the Washington Free Beacon. It fought for the similar bill that was defeated by current FSU president John Thrasher. News reports from that time period showed a shooting at a fraternity house at an FSU owned property involved the daughter of a close friend of Thrasher. At the time, the then-state senator said the bill was "beyond personal" for him. "It will be interesting to see what he does with this one," Culbreath said. The ban on firearms on campuses did not prevent Myron May from shooting three students at the FSU library in late November. May was shot and killed by officers when he failed to surrender outside the library. The firearms ban did prevent an Army veteran enrolled at FSU from taking action, said Culbreath. "He had a clear shot at the shooter but wasn’t able to carry his firearm," Culbreath said. The veteran, who had just returned from a tour in Afghanistan five months before, has asked SCC not to release his name to the media. However, Culbreath said the veteran indicated he would be willing to testify before the Florida Legislature. One of the three students shot and injured in the FSU library was Nathan Scott, a member of Students for Concealed Carry FSU. The group in a release following the shooting said both Scott and the veteran, "in spite of having the training and skills necessary to end the shooting, were powerless to prevent it due to Florida’s laws." The debate about guns on campus was revived in wake of the shooting. According to Culbreath there is now overwhelming support for firearms on campus and its efforts. "I am overwhelmed with the amount of support we are getting from our students, from across the state, and even from the faculty," said Culbreath. "We are getting massive support." He indicated not everyone supports the measure, but he said he "would have expected more pushback." Many of those who are now supportive of allowing firearms on campuses have gained a new perspective after the shooting. "Even some girls who said they never really thought about it, but then when the shooting happened and they were at the library, they have a whole different perspective," said Culbreath. Another university also has decided to advocate for firearms on campus. The Texas A&M University student body president signed the Personal Protection Act on Monday that calls for advocating for concealed carry at its university. "To sign or veto this act was the most difficult decision I have made serving as student body president. This is a very complicated issue of personal rights, but more importantly, public safety. I have discussed it with A&M students, administration, faculty, staff, and police," Kyle Kelly, president of the student body, said in a prepared statement. "I deeply care about and considered every thought and feeling on this issue. I signed the act based on the belief that it was representative of students and in the best interest of Texas A&M University." "Institutions of higher education should not be an exception to the constitutional right to bear arms for self-defense and public safety," Kelly said. While the student body’s action does not change the law on campus, it will now allow it to advocate for concealed carry to university administrators and lawmakers in the state. This entry was posted in Issues and tagged 2nd Amendment, Concealed Carry. Bookmark the permalink.